Colombia's Farc rebels have said they will release three hostages captured over six years ago, for health reasons. The Farc told local media that it would free the hostages in return for mediation efforts made by Venezuelan President Hugo Chavez. The group released two high profile hostages earlier in January in a deal that Mr Chavez helped to broker. 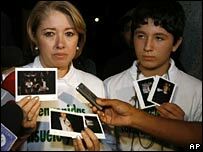 The hostages to be released were named as former lawmakers Luis Eladio Perez, Gloria Polanco and Orlando Beltran. No handover date was given. In a statement, the Farc repeated their desire to exchange hostages for jailed rebels. Such an exchange has been blocked over a Farc demand that the government demilitarise a large area in southern Colombia to enable a handover.